Leif was the first European to reach the shores of Vinland. Due to his judgment and honesty he arrived in Nidaros and was well received by the king Olav Tryggasson and stayed there to teach Christianity. Before they left Nidaros they accepted their faith as Christians. 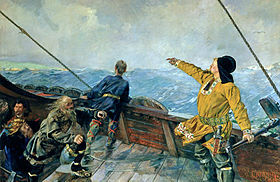 "At the age of 24, Leif was asked to captain his first voyage. He took along a crew of fourteen. The wind Leif was sailing on was fair at the beginning, but after their first day it slowed only to a breeze. It was five days before they sighted Iceland. Most voyages make it in two." The fourteen men "wanted to go ashore but he didn't let them, so they kept sailing." They sailed for awhile and he thought they would run out of food. Finally they saw land, and went ashore. They stayed for a while because a storm. Finally they left and the crew left. Leif Erikson became restless when he returned and he bought Bjarni's boat. He set of with a small crew to the north. On the way he discovered Helluland (Flat Rock Land) and Markland (Woodland). Then he made the best discovery. He found Vinland. This is modern day Newfoundland. He named it this because of all the grapevines. 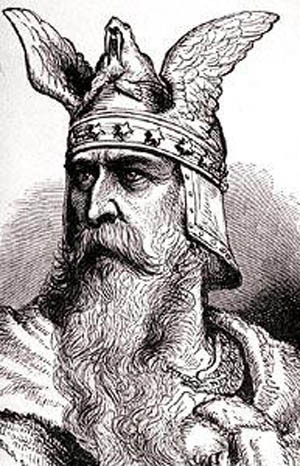 He built houses and founded Vinland. This was his best discovery. Surprisingly a few people returned to Vinland. Only Leif's sister returned and was killed by Indians. Europe remained totally dark about the discovery of the new world. The only reference is to it is in the Norse sagas where most of the info concerning Leif is recorded.